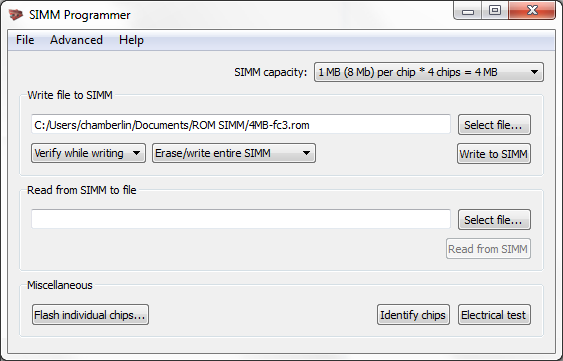 SIMM programmers are now available for the Mac ROM-inator II customizable Macintosh ROM SIMM. If you’ve been waiting for your opportunity to go nuts with ROM hacking, here it is! With a ROM-inator II and this SIMM programmer, you can tweak the Mac’s lowest-level firmware to your heart’s content. Get one now at the BMOW Store. The programmer is a USB peripheral, and connects to your PC with a standard USB B Mini cable (not included). The programmer utility software provides an easy GUI for updating the contents of the ROM SIMM’s flash memory. The utility program is compatible with Windows 7 or later, but you can make it work on OSX or Linux if you compile the software for yourself. It’s based on Qt and should be easily portable. The programmer board has an integrated on/off switch for convenience. Please connect the USB cable and insert the SIMM into the socket before switching the power on. Hot-plugging the ROM SIMM or the programmer itself may cause damage. Yes, I am paranoid. You may be wondering why the programmer PCB is a 6-sided flying saucer shape. In order to fit within the standard 10 x 10 cm area used by many PCB manufacturers, I had to rotate the SIMM socket 45 degrees and place it on the diagonal. The microcontroller and other components all fit within the space on one side of the socket, so I deleted the region of the PCB on the other side of the socket rather than leaving it empty. But that left a rather awkward-looking truncated triangular thing, and it offended my design sense. After some thought, I decided to redefine which way was “up”. I turned the diagonal into a new bottom, and clipped the third corner to match the other two, resulting in a completely unique board shape. Say hello to a new retro-computing gizmo – the Mac ROM-inator II! It will supercharge your vintage Macintosh II series or SE/30 computer, by replacing the stock ROM with a programmable flash memory module. Add a bootable ROM disk, change the startup sound, hack the icons, gain HD20 support and a 32-bit clean ROM. Go nuts! The Mac ROM-inator II is available now in the BMOW Store. The ROM-inator II is derived from Doug Brown’s original Mac ROM SIMM design, used with permission. A portion of sales goes back to Doug. All the early Macintosh computers have some low-level functions stored in ROM. It’s the Mac equivalent of a PC’s BIOS. These ROM routines are responsible for initializing the computer when the power is first turned on, checking to see what hardware is installed, finding an attached disk with OS software on it, and booting that OS. Even after the OS has booted, the ROM routines still handle many low-level functions like interrupt handling, keyboard support, and floppy I/O, as well as some higher level functions like drawing windows and icons. If you can control the ROM, you can control virtually everything in the computer. Nearly every member of the Macintosh II, Quadra, and LC families has a 64-pin ROM SIMM socket on the logic board. In some cases, the stock ROM is in this socket. In others, the stock ROM is soldered directly to the logic board, but it can be overridden by a ROM SIMM in the socket. All that’s necessary is to figure how to build a ROM SIMM that’s physically compatible, and then program it with appropriate software. A few years ago, the important details were reverse-engineered by Doug Brown and others at 68kmla.org in an epic forum thread that stretched to over 1000 posts. The ROM-inator II is a standard PCB, shaped and sized to fit the ROM SIMM socket. It comes pre-programmed with a base ROM image that’s modeled off the Mac IIsi ROM. This is a universal ROM that’s also capable of working in many other members of the Mac II family, including the SE/30, Mac IIx, IIcx, IIci, and IIfx. By patching key ROM functions, it’s possible to alter the Mac’s behavior in fundamental ways – a new startup chime, support for additional disk types, and a modified Happy Mac being a few examples. All it takes is a 68K disassembler and a lot of patience. The stock ROM in most Macs of this period was around 512K in size, but the Mac’s address map devotes a full 8MB to ROM. In a normal Mac, the rest of this address space is unused. The ROM-inator II uses larger flash memory chips to take better advantage of the available address space. The first 512K of flash memory is used for the actual ROM code, and the rest is available for interesting goodies like a ROM disk image. Rob Braun’s original romdrv paved the way for ROM booting, and I’ve made several enhancements, including a startup menu and support for compressed disk images. The built-in ROM disk is a 5.5MB bootable disk image containing System 7.1 and a collection of classic games. Using the ROM disk, it’s possible to create a diskless workstation without any physical disks attached. Once booted from the ROM disk, Appletalk file servers can also be mounted over a local network. The ROM disk image is stored compressed in the module’s flash memory, and is decompressed on the fly as needed, in order to squeeze the largest possible disk image into the available space. This requires 1MB of RAM for caching of decompressed disk sectors, so a minimum of 2MB total system RAM is required. The ROM disk can be mounted as read-only, or as a read-write RAM disk. When first powered on, the Macintosh will play a customized startup sound, and display diagnostic info about the amount of installed RAM, the current addressing mode, and the detected ROM disk type. After a moment, a startup menu will be displayed. To boot from the ROM disk as a read-only disk, press the R key on the keyboard. Or to convert the ROM disk into a writable RAM disk, press the A key. If no keys are pressed after five seconds, the Macintosh will boot normally from an attached SCSI disk, or wait for a floppy disk to be inserted. The Mac ROM-inator II’s flash memory can be reprogrammed using an external SIMM programmer, providing the ultimate in customization. There’s 4MB of flash memory available for any purpose, like a custom ROM disk image, alternate ROM code, digitized sounds, user interface tweaks, or other crazy experiments. Using compression, this is enough for the base 512K ROM image plus a roughly 5.5MB uncompressed disk image. Or fill the whole space with a collection of different base ROMs, selected from a startup menu. Go crazy! The SIMM programmer is currently a DIY project you can build yourself. See the schematics and PCB files, firmware, and host software on GitHub. A second-generation SIMM programmer will be ready at the BMOW Store in summer 2016. Beep! Wouldn’t it be fun to customize the cheery little square wave greeting of your Mac 512K or Plus? With a Macintosh ROM-inator kit installed, now you can. This isn’t a control panel like SoundMaster, that plays while the OS is loaded from disk – it’s the sound that you hear the moment you flip on the power switch. On a normal vintage Macintosh, this sound is generated on the fly by code in ROM, but with ROM-inator you can alter this behavior and create any kind of sound you’d like. Let’s get started! This tutorial assumes you already have a ROM-inator kit installed in your Mac 512K, 512Ke, or Plus. If not, follow the link to learn more or buy a kit. The ROM-inator is capable of many customizations beyond just startup sound hacks, including making a bootable disk contained entirely in ROM. The steps below may look long and complex, but that’s because I want to be thorough and avoid skipping any details. In a nutshell, all that’s necessary is to convert a sound to the proper format, optionally patch a byte in ROM to reflect the sound’s duration, and then use Flash Tool to store the new sound in ROM. First, you’ll need a sound sample to replace the default beep. This can be something you recorded yourself, or a sound downloaded from a source like Freesound.org. The ideal sound will be 0.66 seconds in duration, matching the length of the standard beep sound, but durations from 0 to 1.3 seconds are possible if you’re willing to do a small amount of extra hacking as explained below. For this exercise, I’m going to use the MOOF! sound of Clarus, the DogCow, which I found here. The DogCow was the mascot of Apple Developer Technical Support for many years during the vintage Macintosh era. The moof sound is just under 1.5 seconds in duration – longer than the 1.3 second limit. Fortunately everything from about 1.2 seconds onward is just silence, and can be deleted. In the Audacity window, click the mouse in the timeline at 1.2 seconds, then drag it to the right to select the range from 1.2 seconds onward. Then hit the delete key on your keyboard, and everything from the 1.2 second mark to the end will be removed. In my case, I ended up with a sound that Audacity said was 1.203 seconds in duration. If your sound is 0.66 seconds long, then you’re done – you can move on to the next step below, storing your new sound in ROM. But if the sound is longer or shorter than 0.66 seconds, you’ll need to make a one-byte change to the Mac ROM startup sound routine. If you don’t make this change, your sound will either be cut off too early, or will keep playing past its end while interpreting random memory as sound data. It won’t hurt anything, but it won’t be very pleasant for your ears. Download the file code-patched.bin, which contains the default ROM code for ROM-inator. (By the time you read this, the version linked here may be out of date – see the ROM-inator main page for the latest version.) You’ll need a binary editing tool such as xvi32 to make a one-byte change to this file. Open the file, and examine the byte at offset 0xEF hex, which is offset 239 in decimal. The value at that offset should be 0x28 hex, or 40 decimal. This is the duration of the startup sound, in sixtieths of a second. Multiply the duration of your sound by 60, truncate the result to a whole number, and write it at offset 0xEF, replacing the 0x28 value that was there previously. My sound is 1.203 seconds, times 60 is 72.18, so I’ll write the value 72 decimal, which is 0x48 hex. Then save the modified file as code-patched-for-sound.bin. The last step is to copy the files you created onto your vintage Mac. You’ll need to copy the new sound file, the duration-adjusted ROM code (if any), and the utility program Flash Tool (found on the ROM-inator page). My preferred way to copy the files from a modern PC to a Mac Plus is with Floppy Emu, but it can also be done via a Localtalk network, or by using another Macintosh as a bridge machine for copying to an 800K floppy disk. With Floppy Emu, I put a blank 800K disk image file on my SD card, use a tool like HFVExplorer (Windows) or Fuse HFS (Mac OS X) to copy the files into the blank disk image, then put the SD card in the Floppy Emu and connect it to the vintage Mac. Run Flash Tool on the Mac, and click the radio button to indicate you want to update ROM with a new startup sound. Select the sound file you made, and hit the “Update ROM” button to perform the update. The process only takes a few seconds. If your sound’s duration was not 0.66 seconds and you made a duration-adjusted ROM code file, you’ll need to store that in ROM too. Click the radio button to indicate you’re performing a ROM code update, select your code-patched-for-sound.bin file, and apply the update. The Mac ROM-inator kit is back in stock! The ROM-inator replaces the stock ROM with 1MB of re-writable flash ROM in a Macintosh Plus, 512Ke, 512K, or 128K – making it possible to do all sorts of crazy customizations! The new kit has an updated default ROM image, with a new boot chime, modified Happy Mac icon, and System 6 ROM disk with a small collection of built-in apps and games. All these defaults can be changed by updating the flash memory. Personalize that old compact Mac, and make it fun again! The Mac ROM-inator kit adds 1 MB of rewritable flash memory to your vintage compact Macintosh. A bootable ROM disk is one of many interesting possibilities this creates. The kit comes with a preprogrammed System 6.0.8 boot disk image, but how can you edit the disk image or replace it with a different one? My previous description skipped over some steps that may not have been clear to everyone, so read on for a detailed tutorial on creating and transferring the disk image. The first step is to download or create a new disk image file, to be used for the ROM disk. These files normally end with a .dsk filename extension, and are commonly used with Macintosh emulation tools and disk copy programs. The Floppy Emu disk emulator also uses .dsk files, so if you’ve already got an Emu, you can probably use one of your existing disk image files as a ROM disk. You can also download .dsk files for many old system versions, utilities, and games at tkc8800.com. As long as the file isn’t larger than 864K, and contains bootable system software, it should work. But using an existing disk image is boring. What if you want to create a custom disk image, with your own personal collection of games? There are many ways to do it, including the tools HFVExplorer (Windows) or Fuse HFS (OS X). The method I’ll describe here uses a popular software-based Macintosh emulator called Mini vMac. We’ll use this software to set up a new .dsk file, and fill it with goodies. Download Mini vMac here. It supports OS X, Windows, Linux. Before you can run Mini vMac, you’ll need a Macintosh ROM file (vMac.ROM) and system disk. You can find both in this tutorial file archive. Move vMac.ROM into the same folder as the Mini vMac application you just downloaded, and follow the setup instructions. When the instructions ask you to drag your bootable disk image, use the file HD20.dsk from the previous step’s file archive. You’re now running an emulated Mac Plus! You can attach additional disks by simply dragging the .dsk files into the Mini vMac window. Unlike a real Plus, you can have many disks attached all at the same time. Let’s create a bootable disk image for use with the ROM-inator, containing a few classic Mac games. The archive contains an empty 864K disk image file called rominator-disk.dsk. Drag this file into the Mini vMac window. Download .dsk files for Klondike, Brickles, MacMan. Drag these into the Mini vMac window too. In Mini vMac, drag the System Folder from the System Startup Disk to ROM-inator Disk. This copies the system software, and makes ROM-inator Disk a bootable disk. Copy the games from the other disks onto the ROM-inator Disk. Some of the game disks also contain System Folders. Don’t copy these – only copy the games themselves. Drag the ROM-inator Disk icon to the trash can to unmount it. Your finished ROM disk image is now stored in the file rominator-disk.dsk. Now that you have a disk image file, how do you get it onto your Macintosh so you can write it to the ROM-inator? Once again there are several ways to do it, including connecting your compact Mac over Localtalk to a slightly less ancient Mac that also has Ethernet, or using an external SCSI drive to sneakernet the file from another computer. But the simplest method is to use a Floppy Emu configured as a hard disk emulator in HD20 mode. Normally you would copy a .dsk file to the Floppy Emu’s SD card, so you could use it on the Macintosh as if it were a real disk. But in this case, we actually want the .dsk file itself transferred to the Mac, which means we need to put the file rominator-disk.dsk inside another disk image. We’ll use Mini vMac again. When you see the blinking question mark, drag HD20.dsk into the Mini vMac window. In Mini vMac, on the System Startup Disk, you’ll find a program called ImportFl. Double-click the icon to run it. From your OS X, Windows, or Linux desktop, drag the file rominator-disk.dsk into the Mini vMac window. When prompted, choose a destination on System Startup Disk to save the file. Any location is fine – just remember where you put it, so you can find it later. rominator-disk.dsk is now stored as a data file, inside HD20.dsk. Copy HD20.dsk to Floppy Emu’s SD card. If you haven’t already, update your Floppy Emu with the latest HD20-aware firmware. You can download the firmware from the Floppy Emu product page. Connect the Emu to your Mac, and turn it on. If necessary, press SELECT while the Emu is displaying version info on the LCD, in order to switch into hard disk emulation mode. Reset the Mac. It will boot from the HD20.dsk image on the SD card. rominator-disk.dsk is now visible as a regular file, on the System Startup Disk mounted by your Mac. The final step is the easiest – writing the new disk image to the ROM-inator. The utility program Flash Tool makes this easy, and to make it even easier, Flash Tool is already included in the HD20.dsk image. On your Mac, on the System Startup Disk, you’ll find a program called Flash Tool. Double-click the icon to run it. Under the heading “ROM Area to Update”, select ROM Disk Image. Press the Select File… button, and browse to the location where you previously stored rominator-disk.dsk. Select this file. Press the Update ROM button. You’ll see a progress bar while it’s working. The update takes about 60 seconds. When the update is finished, reset your Mac. You’re done! It looks like a lot of steps, but the whole process only takes a few minutes. Your new disk image is now stored in flash memory by the ROM-inator. Whenever you turn on your Mac, you’ll see the “press and hold R now” message. To boot from the ROM disk, press and hold the R key on the keyboard for a few seconds. If R is not pressed, the Macintosh will boot normally from an attached SCSI disk, or wait for a floppy disk to be inserted. Anyone who used a Macintosh in the 80’s or 90’s remembers the Happy Mac icon – the smiling computer face that appeared on the screen while the machine was booting up. With my new ROM-inator flash memory kit for vintage compact Macs, hacking the Happy Mac icon is easy. The happy face is stored as a 20 byte raw bitmap, beginning at offset $FD2 (hex) in the ROM code file. It’s a 16 x 10 rectangle within the “screen” area of the surrounding Macintosh icon.